… or create your very own. When you need your own sidewalk created, just take a look at this! 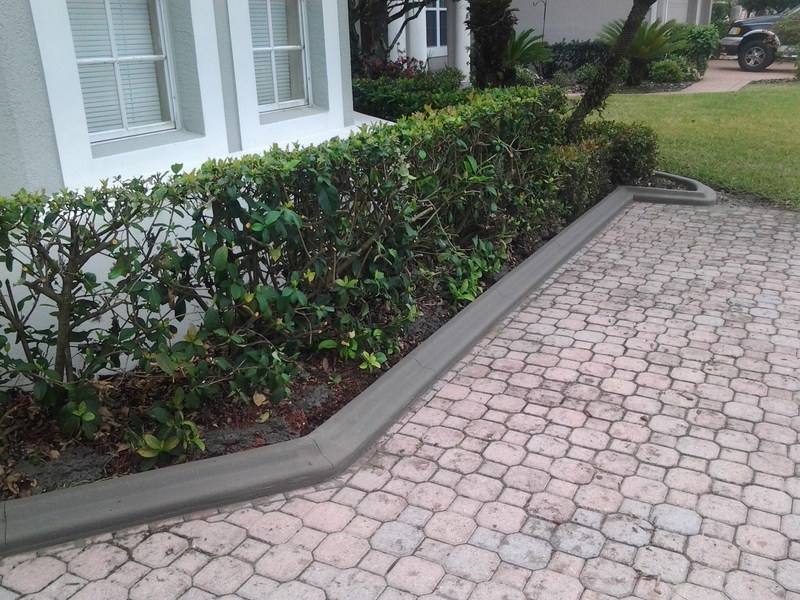 Curb Appeal Concrete Landscaping Borders has been installing borders for almost 20 years! Missing something from your home? Contact us if you’d like a new look at your home! Need an Island? Look how beautifully the borders create this island at the corner of the home. This is a slant style border with color added to bring out the stone! Need a free estimate? Give us a call! We operate within the Central Florida area. Our number is 407.957.9208. We’ve got lots of satisfied customers and we’d love to add you to our list! Locally owned and operated. We have all witnessed the damage the time and environment can put on concrete. Quite often one of the most important steps, curing and sealing, is overlooked in the project. However, you as the homeowner, have options. You simply need to visit your local hardware store and ask the question. I’m sure that they’ll tell you about the best concrete sealer that they have in stock. I call these “over-the-counter” sealants, but in the long run, you will need to reapply them at least twice a year. Does this really save you money? 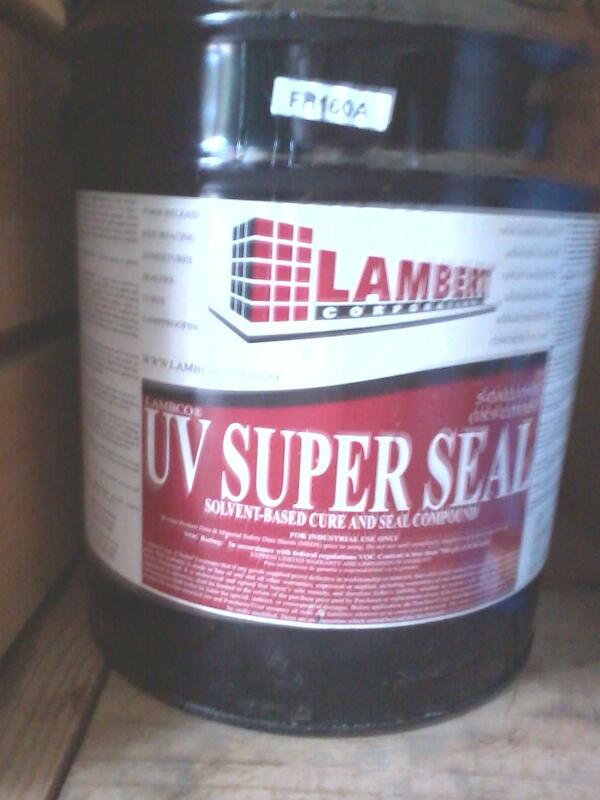 Over the past 18+ years, we’ve tried many products, but what we found to be the best sealant for our concrete landscaping borders comes straight from the commercial end of the industry – Lambert UV Super Seal. You can’t get this at your local Home Depot or Lowe’s, we purchase it in 5 gallon containers directly from the manufacturer. 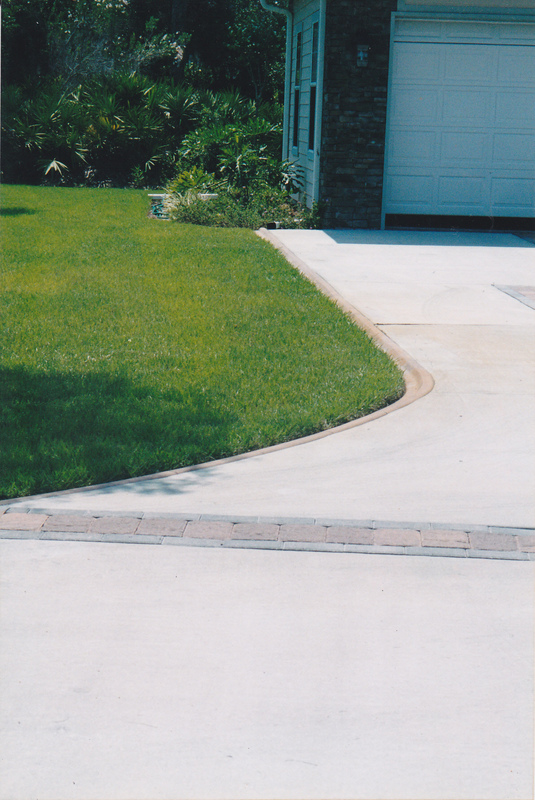 These products are applied at specific timing after the concrete has been placed (usually within 24 hours, but not immediately) and form a resin-layer that both, helps curing with the prevention of too much water loss and creates a film that leaves the project more durable and protects the beauty of the surface. We’ve seen many of our competitors apply sealer immediately, as well as water-down their over-the-counter sealants so they can push it through their store-bought sprayers. But Curb Appeal Concrete Borders has invested money into commercial sprayers so that the product does not need to be watered down, it is sprayed directly on your finished product – usually within 24 hours of installation. You get your money’s worth with us. 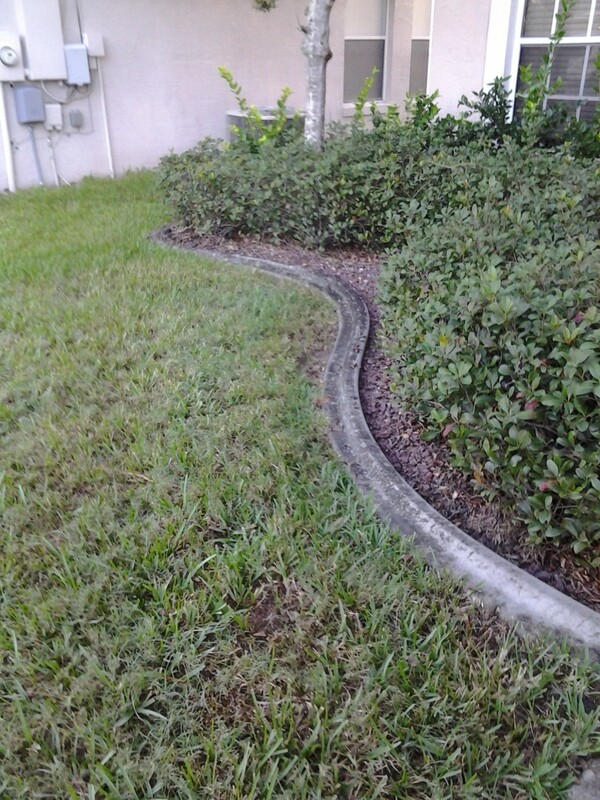 Florida weather has a brutal effect on everything – including the concrete product. Without proper care, you will see mold, mildew and even tannin or rust water stains all over unprotected borders. By applying a proper sealant, your borders could last for years without the need for cleaning. 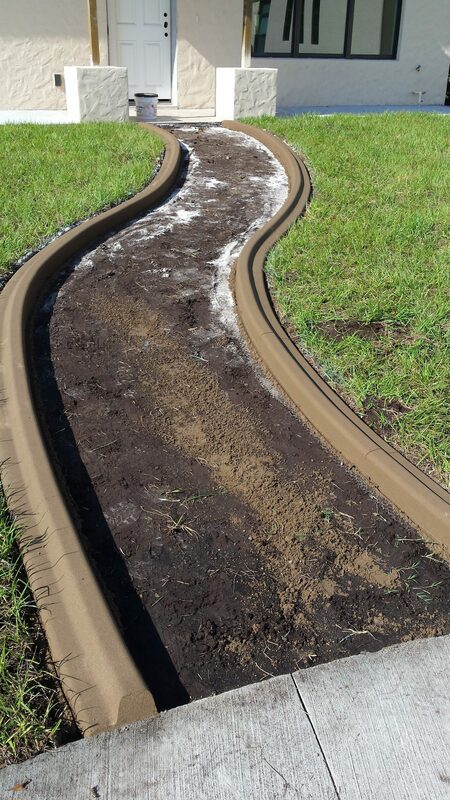 We have found this particular product to be the best in protection for your borders – keeping the elements from permanently attaching to your curbing. 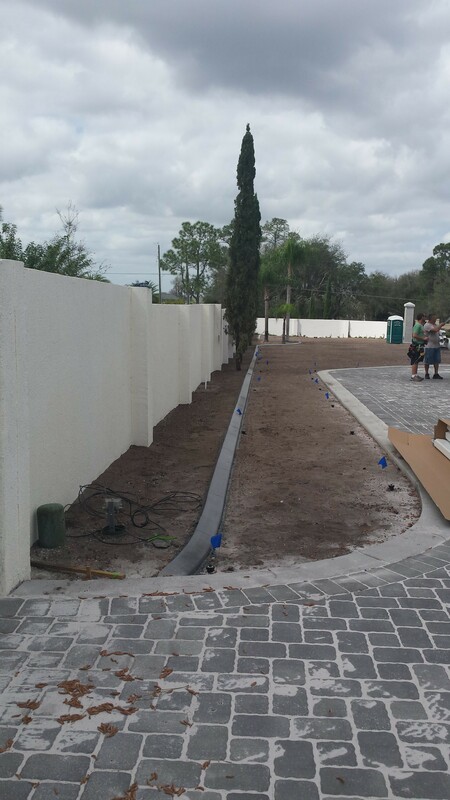 Curb Appeal Concrete Landscaping Borders will be happy to treat our newly installed borders with a protective barrier to keep your product looking great for years! Simply ask us! Call us today for your free estimate! Servicing most of Central Florida. Many of us work by word-of-mouth for our business. When a client is happy, they recommend their supplier. We’d like to take this opportunity to recommend vendors that we’ve done business with over the past years. We’ve had many calls asking who we recommend, so today, we’re dedicating a post to just that – people that we have worked with and would recommend. Landscape Supplies – such as mulch, stone, fountains etc. Nursery – such as plants, mulch, trees and expertise. 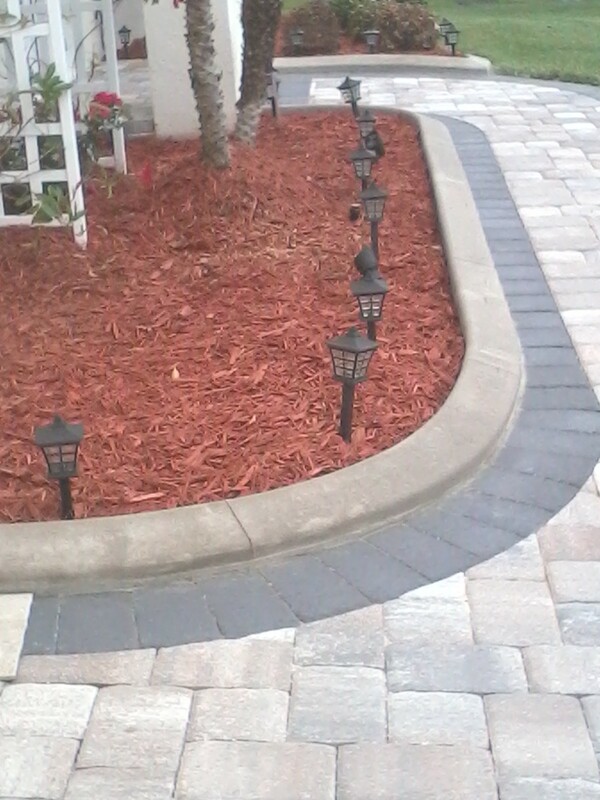 He does things like landscaping, installs trees, rock, mulch, sod, drains and irrigation/repairs. Landscapers (such as design, installation, maintenance, renovations, seasonal foliage and WOW – Mosquito Control. Not only can they transform your landscape, but they also can install a system within your irrigation to make your yard Mosquito Free all-year-round with Green Products! Check them out! Concrete (driveways, slabs, sidewalks and more). Please tell them that Curb Appeal Concrete Landscaping Borders referred you. We all would appreciate your business! Want to Gain Control of your Lawn? I must admit that this season has been incredibly busy! So I’m just checking in to show you some photographs of our latest work this past week. For the job on the left, we were hired on by a Master Builder for a project in the Dr. Phillips area. It was a large job, so we had to prove that we had insurance and workers’ comp for them – no problem! 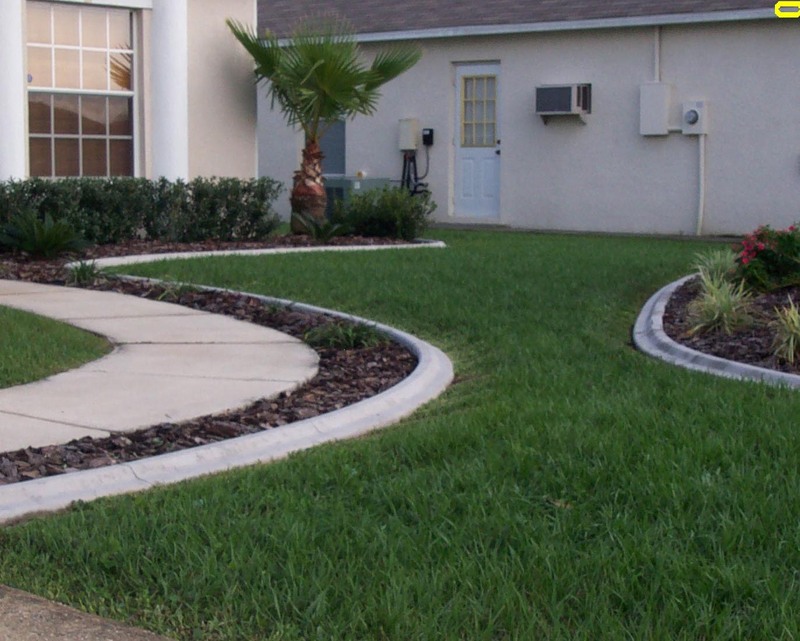 Curb Appeal Concrete Landscaping Borders has been established since 1998, completely insured! We showed up on time and completed the job as agreed. I do want to point out that the pavers were installed by another company, but just look at that straight line! Isn’t that great! The homeowners were extremely happy, so we were too! Another photo from a job a few days prior that I wanted to show you was on a sidewalk. Simply artistic and beautiful, as well as manageable for lawn mowers. It keeps the mulch in, and the grass out! This particular design, I believe, enhances to landscaping and “frames” everything beautifully! Need some help? What are you waiting for? 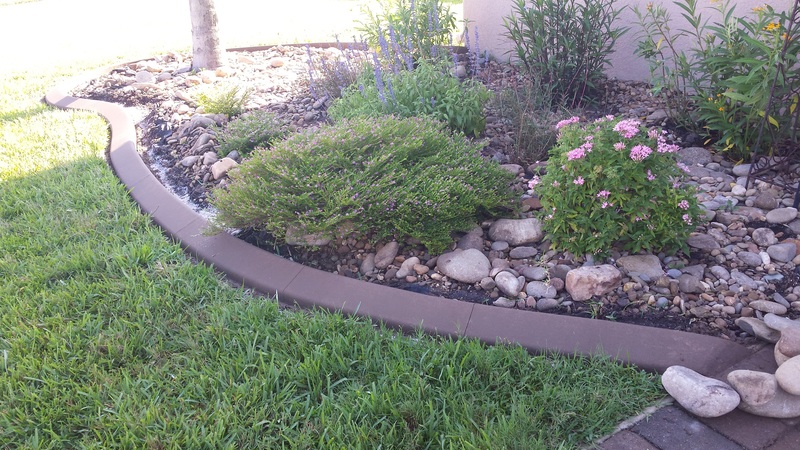 You can control mulch and keep your maintenance to a minimum by having concrete landscaping borders installed. Call us today for your free estimate! 407-957-9208. Serving most of Central Florida. Call me, I can help get your lawn back into shape! With tax refund season rapidly approaching, you might be entitled to a refund! Have you ever thought of reinvesting it back in towards the equity of your home? Whether you’re planning on living in your home for the next 20 years, or just another year; Curb Appeal is very important to anyone who drives by. After all, if your average ‘Joe’ in the neighborhood drives by every day and actually admires your landscaping, then don’t you think that he’ll think that your home is impressive? Here are a few ideas of what some of our customers have done in the past. I think you’ll agree that having a manicured and framed landscape can make a huge difference in the appearance of your living domicile to everyone! Owners elected to paint the curbs with Driveway Paint, which can be any color that the homeowner chooses! Note: Don’t use concrete stain! Keeps mulch in, while also keeping grass out! Also keeps your sidewalk and driveway safer by containing the mulch. Contact us today for your FREE estimate! Proudly serving most of Central Florida since 1997 – we’ve weathered the storm, and we’re still on top! Give us a call – just ask for Scott. We had some things to do in town on Friday, January 1, 2016. Roads were pretty clear in the morning, so after the errands we decided to visit one of the homes that we had done curbing for. We knew that the homeowners were supposed to add landscaping and rocks after our borders were put in, but WOW, was I surprised to see how the pictures came out after everything was done. It’s unusual that we get to see the finished product, but I’m sure you’ll agree, this looks great! Owners elected to paint the curbs with Garage Floor Paint, which can be any color that the homeowner chooses! Note: Don’t use concrete stain! Just because we install the borders doesn’t mean that we’re not willing to help and point you in the right directions to save a few dollars. In this case, the homeowners went to a local paint store and purchased Garage Floor Paint (don’t ever buy concrete stain), and they ordered a color that enhanced their home, and made their borders blend in wonderfully, which saved them money in the long run! Now their landscaping looks like a piece of art! Garage Floor paint contains sealant, which protects your borders from mold, mildew, etc., but you only have to apply the paint in one coat! It is made for smooth concrete, and holds its’ color for many years. Not only does this save money, but it protects the borders, keeping the color intact for many years! For those of you who do not want to physically paint your borders, we also offer color added to the mix, and we do offer a commercial brand sealant – better than what you can buy at your local hardware store. It’s your choice! Beautiful design on existing asphalt driveway. This was actually the first time for me seeing the borders placed on asphalt as opposed to concrete driveways or sidewalks, and I have to admit, I was impressed! This looks so wonderful! Don’t you agree? The homeowners did a beautiful job, and I would be proud to say that Curb Appeal Concrete Landscaping Borders, LLC helped make the Curb Appeal of this home even better! Keeps mulch in (or in this case, gravel), and grass OUT! 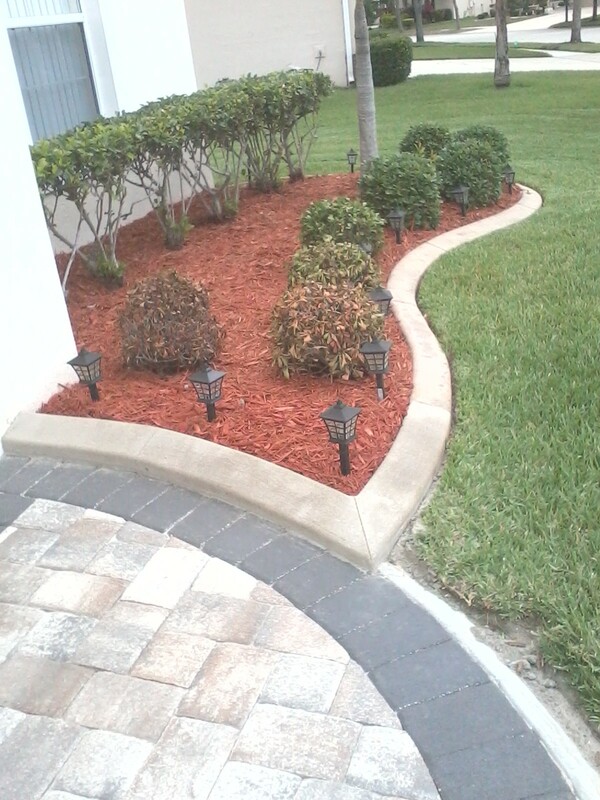 Call us today for your free estimate within Central Florida! You may find that the prices are quite affordable, and will do nothing but enhance your home, adding equity! Get Ready for the Holidays! Are you expecting family over this Christmas? Does your mulch spill out on to your sidewalk making your front entrance hard to maneuver? Consider adding Curb Appeal, Concrete Landscaping Borders to your home! Not only will you be giving your home a manicured effect, but it will also keep your guests safer! 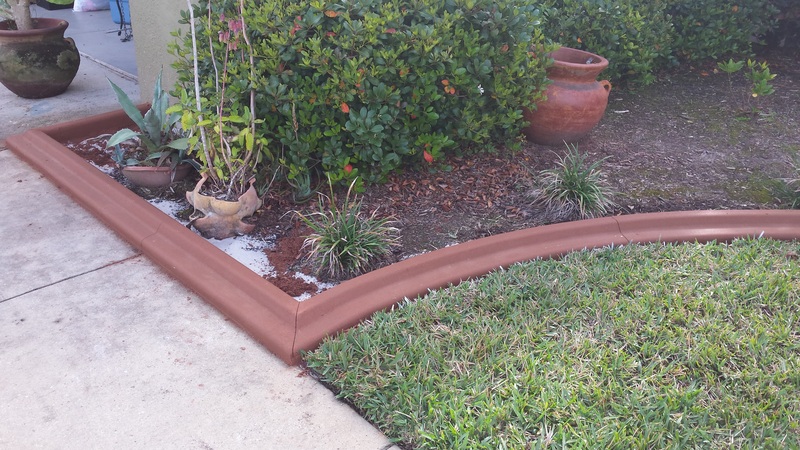 Our concrete borders are 6″ high x 4″ wide, and are durable! They can keep your driveway and sidewalks mulch-free. And, you can choose from a multitude of colors; whether you want them to match your front door, to simply complement your home in a more subtle way. These are not forms, your borders are poured in place to mimic or help design a more cohesive landscaping design around your home. We have the machinery and skill to make this happen for you. 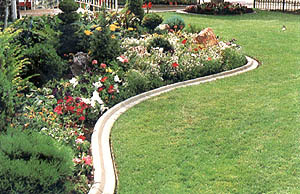 Our team has over 18 years of experience in designing landscaping beds to be mower friendly – making your life easier. And, our borders can withstand residential mowers, and edgers, so taking care of your lawn will be less time consuming. We do have some openings in our schedule in December, so please contact us today at 407-957-9208 for your Free Estimate within Central Florida. Or, visit our website at Curb Appeal Concrete Landscaping Borders to learn more about our product and service. How Much Does Curbing Cost? Even though most curbing companies will come out and give you a free estimate, you still should know an approximate footage that you have before you call, so you can tell if you’ve received a good price. Most companies work with a minimum, which means that they have to charge you a certain amount – even if you have 25 linear feet, or a thousand; we all must work with a minimum. Every time they move that trailer or get a crew, it will cost them a certain amount of money. So, on average (in Central Florida), most companies have a minimum dollar amount to even show up at your house with crew and trailer – let’s say, $450.00 for the sake of this post. That will get you UP TO their minimum footage (usually 75-100 feet) of curbing. Anything over that will probably be charged by the linear foot. However, as I mentioned before, estimates are usually free, so take advantage of a professional in your area. Now, understand that all companies are not alike, and prices/minimums may differ. This is just a “guide” to help you understand the “ball-park” figure, and to know what to expect when hiring a curbing contractor. 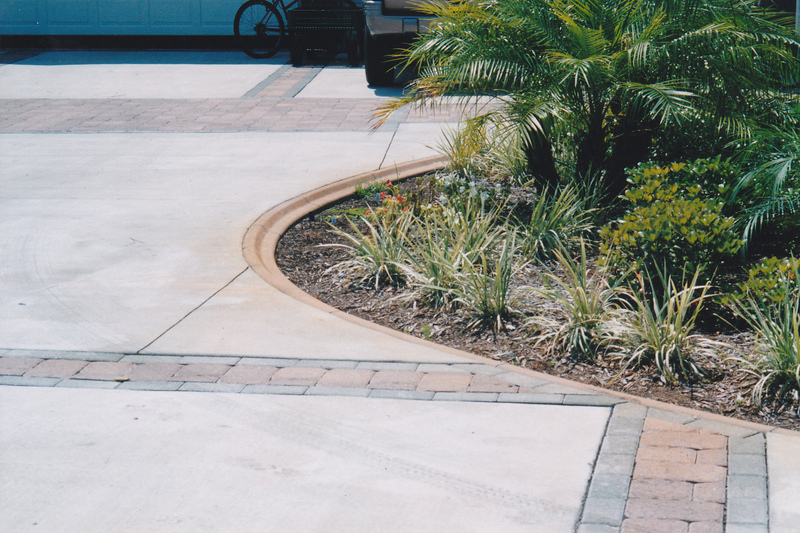 It’s better to work with a contractor who has a solid history in Concrete Landscaping Borders. 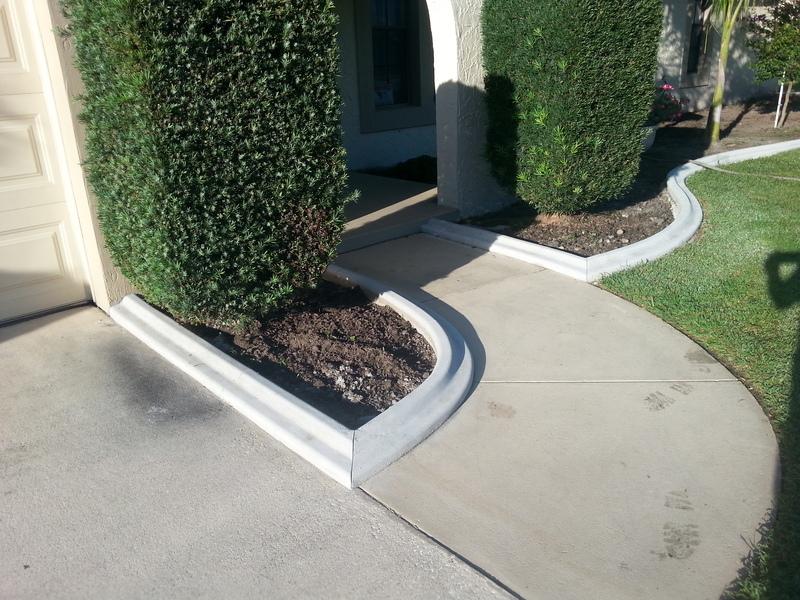 As in all trades, there is a knowledge and experience necessary to make your curb installation right. 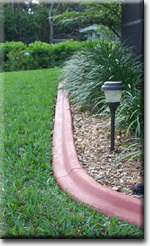 And, our curbing is 4″ x 6″, which is a lot more stable/sturdy that some others out there. This is a diagram of the most popular “Mower Style” that we offer. It is 4″ x 6″. I also want you to keep in mind that the company has to purchase equipment, tools, trailers, trucks, fuel, uniforms, insurance, concrete, dyes, fiber, employee’s, taxes and so forth. This is another reason that you should only hire someone who is established in your area. We can handle the overhead, and do not ask for money in advance (or at least we don’t). And, we can take all major credit cards, so if you’d like this option, please let us know! Ask them how long they have been doing business here in Central Florida. Can they show you their actual work, or refer you to another homeowner close by so you can see yourselves? You want to make sure that you can get help to replace or repair if you need it. You can’t do that if your selected less experienced contractor is out of business. 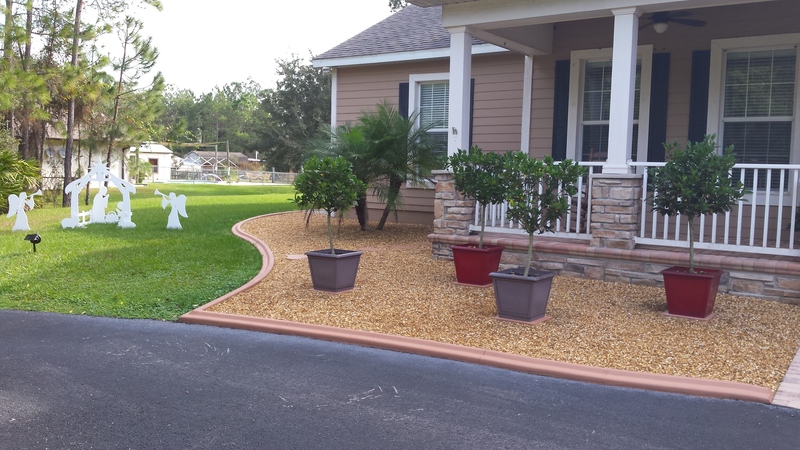 Curb Appeal Concrete Landscaping Borders has been proudly serving Central Florida for 18 years right here! Our professionals are available to assist you! Contact us today at 407-957-9208 for your free estimate. 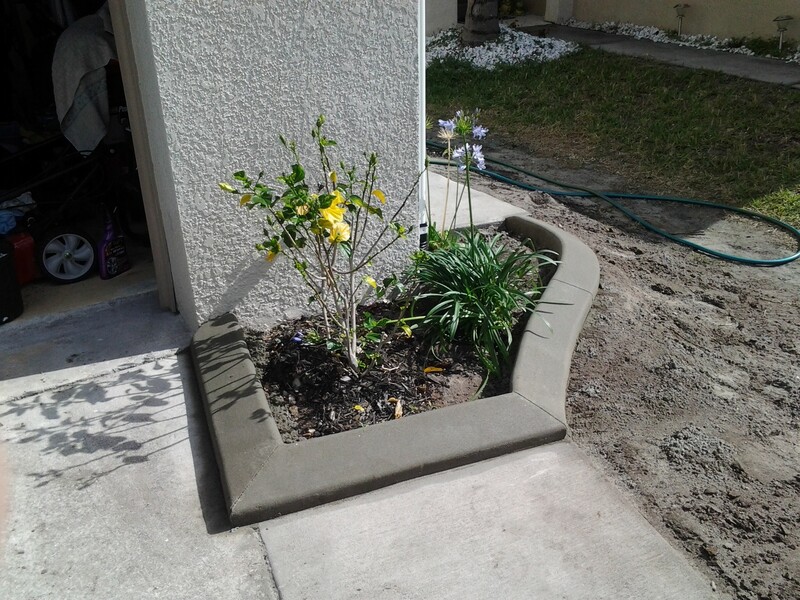 Visit our Curb Appeal Concrete Landscaping Borders, LLC website to learn more! Curb Appeal Concrete Landscaping Borders Payment Options: Cash, Check and all major credit cards accepted. Mosquitoes Ruining Your Evenings? Wow! Wow! Wow! Automatic Organic Mosquito Control that works! Sprinkler Magician is a mosquito control system for your entire property – anywhere you have sprinklers. Our affordable and easy to install product lets you take back control of your yard, don’t get chased indoors again! The patented system is the only irrigation based system that really works. The reason is that all competitors’ systems distribute their (often toxic) mosquito concentrate during the irrigation watering cycle. This results in it getting over diluted and washed onto the ground. Sprinkler Magician runs its own independent cycle, running the irrigation just long enough to deliver the concentrate and so ensuring it dries on plants and all surfaces. You have an organic way of creating a bubble around your property that is safe for you, kids and pets but is extremely unfriendly towards mosquitoes and at least a dozen other targeted pests. This is a new approach to pest control that takes back your yard from the biting critters! The Sprinkler Magician system kills and repels biting insects in residential and commercial properties, creating an environment around your property that is extremely unfriendly towards targeted pests. The system handles mosquitoes and other pests where they hide, in plants and lawns – using our potent natural concentrate that has 6 active ingredients. What Insects & Pests Does It Control? The liquid concentrate is a completely natural formula, as well as mosquitoes it also handles fleas, ticks, spiders, biting flies, gnats, no-see-ums, Fire Ants, Fruit Flies, Chinch Bugs, Lawn Grubs, Chiggers, Silverfish, Crickets, Mites, Palmetto Bugs, and most other biting insects. 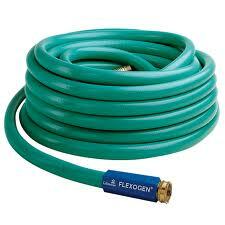 Various other concentrates can be used in the Sprinkler Magician system. Sprinkler Magician is currently developing and testing concentrates that are designed to repel other animals that may be pests in certain areas such as snakes, deer, rabbits and others. For example we are getting extremely good results with an all-natural Deer repellent currently being tested in the New Jersey area. Rid your yard of Mosquitoes! Sprinkler Magician organically eliminates mosquitoes and other biting pests from your yard, so you can enjoy your outdoor space again. Sprinkler Magician is a patented distribution technology that hooks up directly to your current sprinkler system. Once it is in place, it automatically disperses the 100% organic Mosquito Magician concentrate across your yard at appropriate intervals, killing mosquitoes and other biting pests for up to two weeks. Disperses Mosquito Magician after your system’s watering cycle, so the concentrate is not washed away. Is 100& safe for kids and pets, but deadly to biting pests. Actually eliminates pests, rather than just driving them away. Interested? 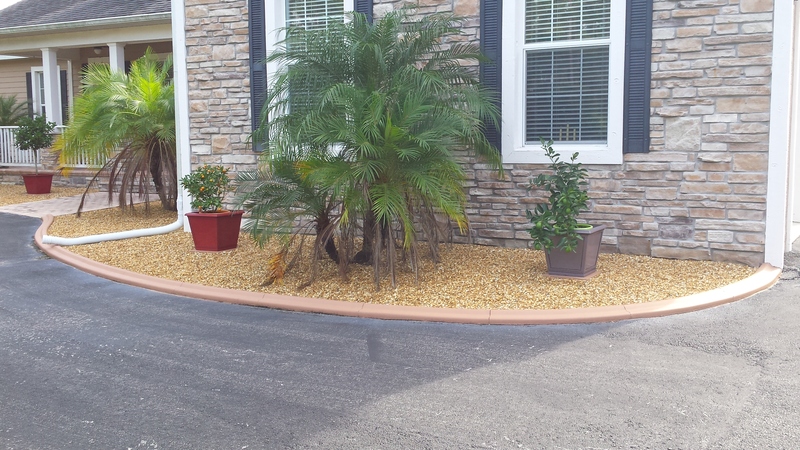 Call Landscape Builders at 407-509-1011 – ask for Cindy. You’ll be so happy that you did! Proudly brought to you by Curb Appeal, Concrete Landscaping Borders. Tell her that we sent you! When you decide to get new mulch for your landscaping beds, please, don’t just load new mulch on top of the old. You actually need to scrape the old weathered mulch from the beds and replace it with new mulch. If you don’t, you start creating a “mound effect” which will always spill the mulch out into the yard whenever we get a heavy rain. When you buy new mulch, they always recommend that you add 2-3″ thick. That doesn’t mean that you should add 2-3″ on top of existing. That means that you should scrape the old stuff out – dispose of it, and replace with 2-3″ of new mulch. Many people don’t think about this, but many of our customers have this ve ry complaint – “My mulch spills into my grass!” This doesn’t necessarily mean you need borders – but perhaps you need a little maintenance instead. However, borders are, in my opinion of course, the best way to go! Contact us today for your Free Estimate for bordering your home and keeping it safer to walk on your sidewalks and driveways. Take a Look – This Is OUR Work! Sometimes, Pictures Work Better than Words. Unsolicited Testimonials – You Die for Them!